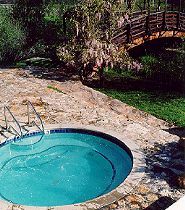 Vichy Hot Springs Resort, a two hour drive north on Highway 101 from San Francisco, is California's oldest continuously operating hot springs resort. Opened in 1854, the original buildings have been completely renovated and individually decorated. 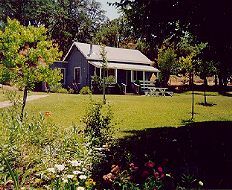 Bed & Breakfast is offered for guests in 22 rooms and 4 self-contained cottages. A few feet from your room await the natural tubs built in 1860 and used by the rich and famous in California's history including Jack and Charmaigne London, Mark Twain, Teddy Roosevelt and his daughter Alice, Ulysses Grant and pugilists Jim Corbett and John L. Sullivan. 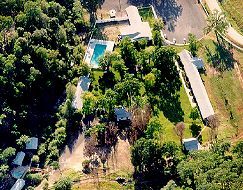 Vichy Springs features North America's only naturally sparkling 90 degree mineral baths, communal hot pool, Olympic size pool, Swedish massage and herbal facials plus 700 acres for hiking, jogging and picknicking. Rates $110.00-$185.00 (Single)and $145.00-$245.00 (double), Children encouraged, smoking outside only, all credit cards accepted, credit card or cash deposit required for reservations. This and other Mendocino Resort, Bed and Breakfast Inns can be found here in The Register.